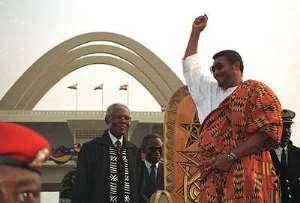 Former President Jerry John Rawlings has called on the Kufuor administration to stop branding him a threat to the country's security and stability and rather concentrate on instituting concrete and long-lasting measures that will appreciate the economic and social conditions of the broad masses of the people. He described as ironical the situation in which the administration after three and a half years of assuming the reins of political power in the country still consider him as a potentially dangerous element to state security instead of focusing on ways of ensuring the qualitative improvement in the living conditions of the vast majority of the people. Ex-President Rawlings said this at a public symposium to climax the 25th anniversary of the June 4 Uprising at the Arts Centre in Accra last Friday. The symposium which was on the theme ,” June 4 and the challenges of the time” attracted leading functionaries of the National Democratic Congress (NDC) including the Presidential Candidate, Professor John Atta Mills, Alhaji Huudu Yahaya, Dr Josiah Aryeh, the June 4 Movement, December 31st Women's Movement and the patriots club. According to Former President Rawlings, the people are not interested in statistical evidence of economic progress which does not translate into reducing the high cost of living and improvement in the real wages and salaries of the workers in the country. He said statistics are of no relevance to the people when the situation on the ground indicates a steep appreciation in the prices of goods and services over the past years which their incomes cannot meet. Former President Rawlings said the administration has over the period employed crude propaganda tactics as a ploy to incite the emotions of the people who have failed to see through such intrigues against him in order to cover its failure to deliver their campaign promises. He said the administration had always found excuses and blamed him and the NDC for the present state of affairs in the country stressing that this implies that the New patriotic Party (NPP) government has not yet settled to address the concerns of the people to enable them to lead meaningful lives. The former president said he will no longer play into the hands of the government and what he termed its “spin doctors” to divert public attention from the hardships that the people are going through due to the implementation of policies and programmes which are anti-human and anti-development. “If the media thinks I am going to make a “boom” speech today, they will be highly disappointed since I will no more play into the hands of the government propaganda machinery,” he said. Ex-President Rawlings said conditions of life for the majority of Ghanaians had witnessed a marked deterioration ever since the electorate endorsed the NPP to manage the affairs of the country in the 2000 general elections. He said poverty and deprivation had engulfed the society and are threatening its smooth development and called on the gathering to work hard to ensure that the NDC is voted back into power to restore hope and dignity to the people. Former President Rawlings spoke at length about the conduct of the photo-taking exercise by the Electoral Commission (EC) and remarked that various vile schemes had been designed by the enemies of the NDC to sabotage the exercise and defranchise eligible voters, especially in the Volta Region which is perceived as a stronghold of the party. He therefore called on activists of the party to inform the members of the party about proposed dates for the exercise in regions where the EC is yet to cover and also ensure the strictest vigilance at the polling stations within the period of the exercise. The General Secretary of the NDC, Dr Aryeh on his part said the June 4 Uprising set a new political paradigm for the nation through the institution of the principles of probity and accountability.He described the uprising as a historic event in which former President Rawlings and a group of revolutionary, minded officers and men intervened to halt the economic decadence in the country and restore its fast faded international image. The National Co-ordinator of the Association for the Defence of the Revolution (ACDR), Nii Adjei Boye-Sekan said no amount of distortions by the ruling government will water down the significance of the event, adding that “ June 4 has become a veritable epoch in the annals of the country's history,”.